Nospi allá mi llave, de 1! According to local slang, a llave is an amigo, a friend, someone you can count on. As an added bonus, llave officially translates as key. For the most part, the team at Cartagena Connections are not officially guides.. and we don't really want to be. When we picture "guides" we envision those folks with the lollipop signs or flags, using microphones, leading packs of shuffling tourists that have been made to wear name-badges. A big generalisation, and maybe unfair, but there you go. Anyway, we don't want to be "guides". And we don't really want to offer "tours". What we aim to be is your local friends, your llaves. Your keys to unlocking the best of the city. We all have individual interests and passions that will offer local insight. We all love sharing these in our non-tour tours and helping you experience our hometown in a way that is most meaningful for you. Australian born and bred, but internationally informed, Kristy's heart has been captivated by Cartagena de Indias and she's planning to stick around. With a preference for substance over style, you are likely to find Kristy hungrily sucking the marrow out of life at every possible opportunity. Her quest to savour everything to the fullest sees her flitting from sweaty dance sessions, to the manic market, to happening bars, to gastronomic greats, to fashion-forward retailers, grassroots artesanos, to the great outdoors and almost anything and everything along the way. Some of Kristy's grand accomplishments include being chosen as a Judge in the Cartagena Fried Food Festival, being called "affable" and "vivacious" by Conde Nast Traveller Magazine, being pulled up to dance champeta on-stage at El Rey de Rocha Picó, and being called La Australiana Champetua by El Universal newspaper. Also check out FAQ So.. Kristy, what brought you here in the first place? Local Cartagenera, Catalina, is a weird and wonderful mix of creative powerhouse and organisation obsessive.. and we have no idea what we would do without her. When she is not answering approximately 723,000 emails and enquiries and requests and phone calls every day, she is working on her graphic novel, coveting designer handbags and planning dinner reservations somewhere delicious. Catalina also loves showing visitors her amazing city (when we let her escape the office) and has even developed a darkly fascinating evening Ghost Tour for those looking for something different. Probably the most relaxed German ever invented, Jan (pronounced Yan), is a total convert to Cartagena living and has done an impressive job getting local in rapid time. It helps that he is enamored with a Colombiana (Natty is an amazing photographer if you'd like any portraits or photoshoots whilst in town **end plug) and that he is just so darn nice and likeable. He loves food and bakes delectable German treats like nobody's business (which you can sample at his spot Cafe de la Mañana). He loves getting down and dirty and local, leading tours to the Mercado, streetfood tours and historic tours. He is also the only Cartagena Connections llave, to have never ever been late to a tour. We guess (thankfully) there's some German traits that remain. 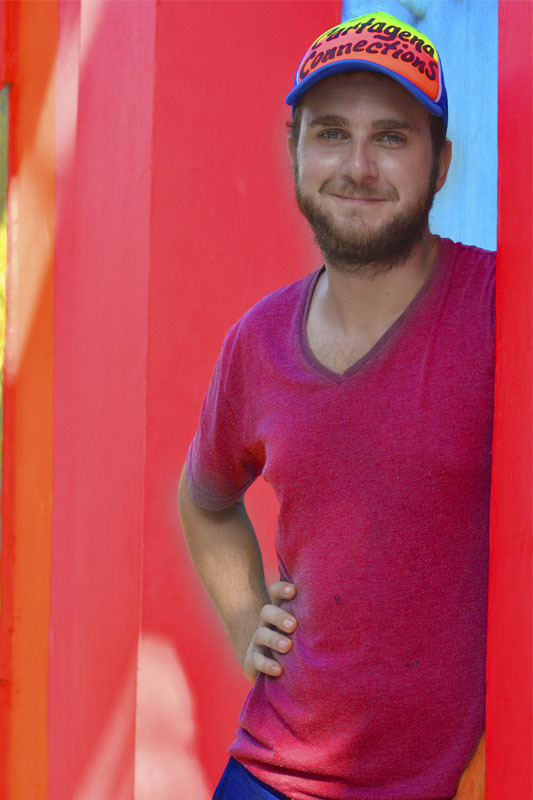 Music man Dan is pure good vibes and will ensure you have the most fun and enjoyable experience in Cartagena possible whilst connecting to all the things that make the city special. He loves the food tour, street art, the manic mercado bazurto and everything music and dance. You can book him for private tours and he also makes a great local host to lead nocturnal party/music/dance tours - taking you to the best spots, showing you some new moves, translating and allowing you to party stress-free. He'll be your new best friend for your entire visit (and beyond) and the perfect llave to unlock local-style Cartagena. As an added bonus, look out for him playing gigs around town - you'll love his funky style! Although her blonde hair, fair complexion and blue eyes say differently, and despite no one ever believing her, Sofi is born and bred Cartagenera. Her time living and studying in the US and Bogota might have polished her fluent English, but it did nothing to diminish her love for all things costeño. Sofi loves local food delights, loves dancing (especially champeta) and is fascinated by the city's incredible history. She's trained as an artist and loves leading new visitors on art tours. We're super happy to have her as part of the team of local hosts and know you will love seeing and experience Cartagena with her. Whip-smart Naty is another born and bred Cartagena local who loves sharing her hometown with all you fabulous visitors. With perfect English and friends from around the world, she was an unofficial tour-guide well before Cartagena Connections came a-calling. The fact that now she actually gets paid for all that local knowledge is a nice bonus. Naty loves the streetfood tour and the new drink + dance tour and has also developed a special kid-friendly family tour designed with lots of pirates and ghost stories and interactive experiences to keep the kids amused. As an extra service, Naty is also available as a super experienced, English-speaking babysitter for those days or nights you'd rather explore Cartagena child-free. Just book it in! The vibrant Kristen joins our team from sunny Los Angeles, where she trained and performed as a professional singer (Opera, no less). 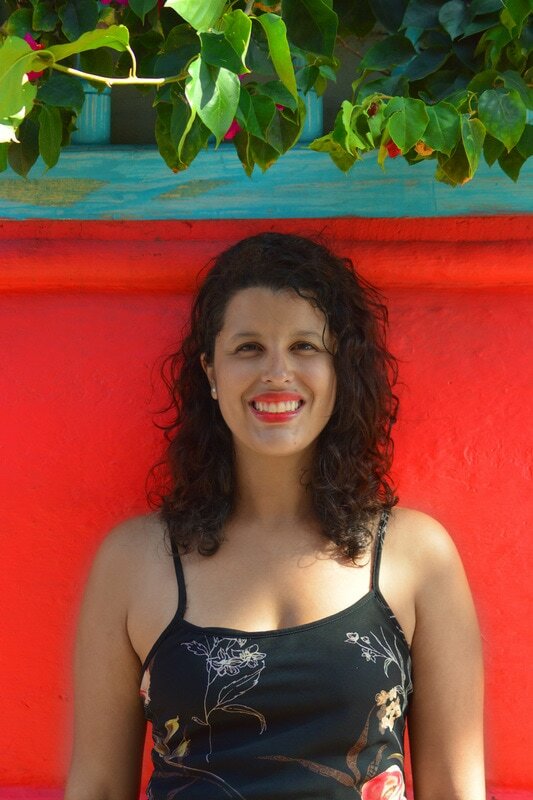 After having well and truly caught the latin bug, and singing and salsa-ing her way into the hearts of everyone in Cartagena, she's now one of our go-to-locals for personalised tours of Cartagena, in particular, its food, music and dance. Kristen's style is relaxed and fun, with plenty of laughs and, if you want, stops for cold cervezas along the way. Be sure to ask her to bust out a few salsa steps - you'll be amazed. Lover of languages, beer, and Ernesto Sabato’s books, this native from the coast has his heart spellbound by the walls, history, food, colours and sayings of this beautiful city. After a childhood spent in this heavenly bay, Juan Sebastian started, a few years ago, to wander the world, which allowed him, not only to perfect 4 languages, Spanish, English, German and Portuguese, but to understand the specifity and uniqueness of his Caribbean native paradise. Now he's back in his hometown, thrilled to be sharing it with Cartagena Connection visitors. Juan's tours tend to focus mostly on his passion for politics and history, but since Kristy has now shown him where to find the city's best fried treats, Juan will also very happily join you for food adventuring as well. We also share our connections to the best and most reputable tour operators and providers for when your travels take you beyond the walled city. And for visitors requiring customised tours, group planning, itineraries and event planning, we are available to provide personalised concierge services by private arrangement. Kristy's incredible zest and enthusiasm and her enormous network of local connections make Cartagena Connections your perfect partners in gaining a local perspective to the best bits of Cartagena de Indias. So get connected!